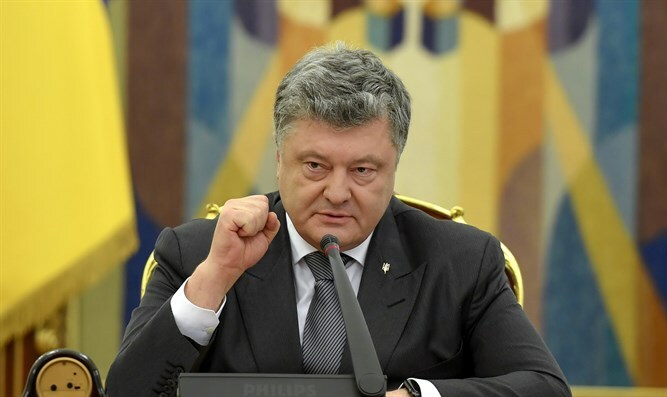 Ukraine's President Poroshenko promises swift action against perpetrators of discrimination and anti-Semitism. Ukrainian President Petro Poroshenko condemned “any manifestations of intolerance and anti-Semitism” in his country following a series of neo-Nazi and other recent anti-Semitic events there. Poroshenko posted the statement Friday on his Facebook page. The anti-Semitic events in Ukraine include a march in Lviv to commemorate the World War II Ukrainian Galicia SS division and remarks by an ultranationalist leader at a public event in Odessa. On Wednesday, Tetiana Soikina, the head of Odessa’s regional department of the Right Sector ultranationalist group, at the March of the Ukrainian order in that city said Ukraine “will belong to Ukrainians, not Jews.” The Lviv march was held at the end of last month. The Ukrainian Foreign Affairs Ministry issued a statement Saturday rejecting allegations of an increase in anti-Semitic incidents in the country. “Ukraine consistently condemns any manifestations of intolerance or public anti-Semitic appeals. Law enforcement agencies investigate and prosecute everyone guilty of such violations,” the statement said. “We hope that his repudiation of any glorification of neo-Nazi ideology and other anti-Semitic outrages will send a clear signal to the Ukrainian people that bigotry in all its forms is unacceptable in our society,” WJC President Ronald Lauder said.